Offering one of the largest soil laboratories in the country, Midwest Laboratories, Inc. has been serving the agricultural industry for over 30 years. Midwest boasts a state-of-the-art facility with one of the fastest sample turnaround times offered in today’s market. With five support buildings that comprise the Midwest Labs’ campus, we employ over 90 experienced staff members. The Midwest Agricultural Department offers testing in the areas of soil fertility, fertilizer and lime, manure, biosolids and compost, microbiology, organics, pesticide and herbicide residue, plant tissue and seed germination. We offer a wide variety of certifications and participate in proficiency programs that help demonstrate our dedication to accuracy and precision. Through years of experience, Midwest Laboratories, Inc. has become a true environmental laboratory with a strong base in both agriculture and industry. Midwest Laboratories is NELAC-certified in Florida, Utah, Kansas, New York, Washington, Texas and California for non-potable water, metals and wet chemistry. As a green company, Midwest Laboratories is concerned about the environment and factors contributing to the decline of the environment. The Midwest Environmental Department employs sampling crews for specific environmental water testing on wastewater, storm water, landfill water, irrigation, and testing for consumption viability for livestock. In addition, we offer tests for biomonitoring or Whole Effluent Toxicity (WET), inorganic environmental and metals, microbiology, organics and pesticides/herbicides by gas chromatography, petroleum contamination, hazardous waste and XRF Technology for elemental analysis. Midwest Laboratories owns a multitude of sampling and monitoring equipment available for use at specified rates. With over 30 years of experience, the Midwest Feed Department is one of the largest feed labs in the country specializing in testing of general feed products, as well as domestic pet food. All feed/pet food testing uses standard wet chemistry testing methods. In addition, Midwest Laboratories offers microbiological and antibiotic testing, as well as tests for melamine and related compounds. AAFCO-compatible testing is also available for cat and dog food. Due to the importance of feed testing, Midwest Laboratories offers fast turnaround times and accuracy through BAXTM – the DuPont Qualicon System of testing. Certified by the United States Department of Agriculture (USDA) for moisture, protein, fat and salt testing, the Midwest Food Chemistry and Microbiology Departments are experts in food and microbiology testing. Midwest Laboratories utilizes state-of-the-art instrumentation to provide complete nutritional labeling, shelf life studies and proximate analysis for food products. 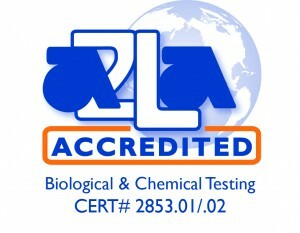 In addition, Midwest Laboratories is certified by APHIS for microbial analysis and testing of exported food products. With strong roots in agriculture – and corporate headquarters in the heart of the Midwest, it’s easy to understand why Midwest Laboratories, Inc. has expanded its testing services to fuel sources like ethanol. Offering a full-service ethanol laboratory in its Fuel and Wet Chemistry facility, Midwest Laboratories holds ASTM proficiencies in denatured ethanol (ASTM D4806). The Midwest Fuels Department offers testing for ethanol, solvent and petroleum contamination for underground storage tanks and surface spills. Specific to ethanol fuel, Midwest Laboratories offers denaturant testing, a California Air Resource Board (CARB) requirement.